Cordial greetings to you in the precious Name of our Lord Jesus Christ, who suffered for us, leaving us an example, that we should follow His steps. May His comfort be with us in all our sufferings, and may we be granted grace to reckon that the sufferings of this present time are not worthy to be compared with the glory that shall be revealed in us. The Lord has been good to us the year 2008-09. This year the Lord has opened amazingly many doors to start new CLCI congregations. This has been the beginning of our CLCI ministry in many new rural and tribal villages of Andhra Pradesh State. It was a great blessing for these newly established CLCI congregations to meet honorable missionary Rev. Koenig. The Lord has used Rev. David in a great way in this evangelism tour. Even though the night prayer meetings were filled with fog and heavy dew, many hundreds of people heard the Word of God from Rev. David. The sermons preached by Rev. David were very strong and I sensed the work of the Holy Spirit in his Gospel preaching. 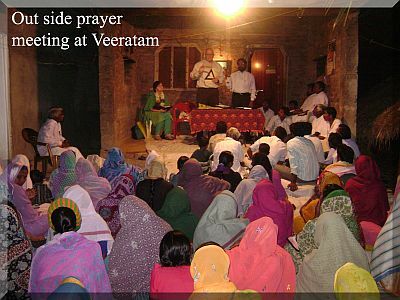 During these nine solid days from 23rd January to 31st January 2009, we have visited 13 CLCI churches in the districts of Guntur and Prakasam. We have visited 9 congregations in Guntur District. Then we drove to Prakasam district and stayed in Ongole for four days and visited four congregations. A total of 13 churches received ministry. During this tour of outreach in January, nearly a thousand members heard the good news of the Gospel. The glory of God was there in all the nights. Many people were touched, encouraged and equipped with the Lord’s strength. Members and Pastors were refreshed, challenged and revived by the manifest presence of God’s word. On 31st January, Rev. David preached at Mallavaram CLCI church prayer meeting. Rev David preached on seven “I am’s” from the Gospel of John. It was a wonderful meeting. Some of the women and children recited all the seven “I am’s” that night. We have distributed New Testaments to the children and John’s Gospel to the elders in all the congregations. Rev. David prayed for many sick people in most all the congregations. Broken lives were restored and wounded hearts were consoled and refreshed. Rev. David preached in English and I translated into Telugu. There were many great things the Lord did in this visit and only eternity will tell. I give God all glory for this wonderful mission. Surly the CLCI was blessed by this outreach.